SENATE BILL NO. HO– USE BILL NO. 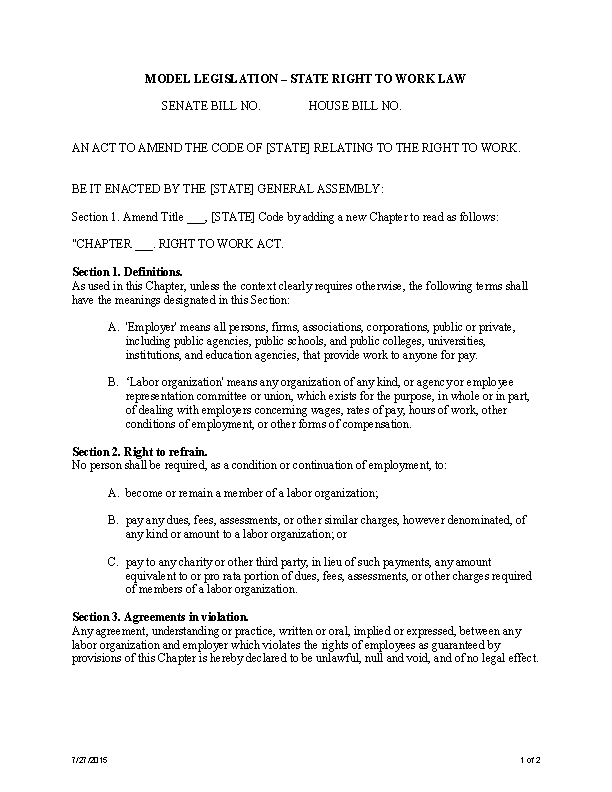 AN ACT TO AMEND THE CODE OF [STATE] RELATING TO THE RIGHT TO WORK. “CHAPTER . RIGHT TO WORK ACT. A. ‘Employer’ means all persons, firms, associations, corporations, public or private, including public agencies, public schools, and public colleges, universities, institutions, and education agencies, that provide work to anyone for pay. B. ‘Labor organization’ means any organization of any kind, or agency or employee representation committee or union, which exists for the purpose, in whole or in part, of dealing with employers concerning wages, rates of pay, hours of work, other conditions of employment, or other forms of compensation. Section 2. Right to refrain. C. pay to any charity or other third party, in lieu of such payments, any amount equivalent to or pro rata portion of dues, fees, assessments, or other charges required of members of a labor organization. Section 3. Agreements in violation. Any agreement, understanding or practice, written or oral, implied or expressed, between any labor organization and employer which violates the rights of employees as guaranteed by provisions of this Chapter is hereby declared to be unlawful, null and void, and of no legal effect. Any person who directly or indirectly violates any provision of this Chapter shall be guilty of a misdemeanor. Superior Court shall have jurisdiction to hear and determine any violation of this Chapter. Any person injured as a result of any violation or threatened violation of the provisions of this Chapter shall be entitled to injunctive relief against any and all violators or persons threatening violations. Any person injured as a result of any violation or threatened violation of the provisions of this Chapter shall recover any and all damages, including costs and reasonable attorney fees, of any character resulting from such violation or threatened violation. Such remedies shall be independent of and in addition to the penalties and remedies proscribed in other provisions of this Chapter. Section 7. Duty to investigate and enforce. It shall be the duty of the Attorney General of this State, and of the prosecuting attorneys of each county, to investigate complaints of violation or threatened violations of this Chapter and to prosecute all persons violating any of its provisions, and to take all means at his or her command to ensure effective enforcement. where they would otherwise conflict with, or be pre-empted by, federal law. Section 10. Conflict of Provisions; Effect. Wherever the application of the provisions of other statutes or laws conflict with the application of the provisions of this Act, this Act shall prevail.